The Cook Islands Ministry of Health is a key partner in the Pacific Science for Health Literacy Project. The annual conference of the Cook Islands Ministry of Health offers an important opportunity for the PSHLP team to share findings with the Ministry of Health community and to learn about work from within the Ministry that PSHLP can link into learning programmes. The team was well represented at the 2018conference with presentations from Principal Investigator, Jacquie Bay, along with postgraduate students Siobhan Tu'akoi, Heimata Herman, Mayor Pokino and Alvina Pauuvale. Presentation abstracts and slides are available for download. 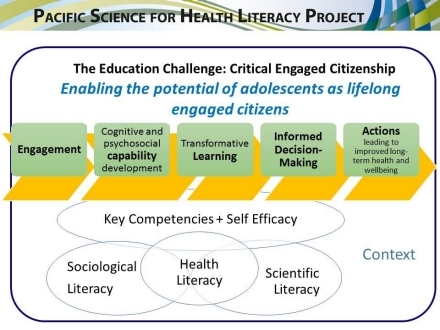 Background: The Pacific Science for Health Literacy Project pilot (2013-2017) identified that school-based multisectoral interventions facilitated sustained healthful behaviour change for adolescents and increased inter-sectoral interactions. The project promoted positive professional practice change in the health and education sectors, and facilitated development of evidence-driven policy and planning in schools. These outcomes signalled that ongoing implementation may support the potential for sustained long-term benefits. Transforming a project from pilot to sustainable practice requires commitment from all stakeholders to engage in the strategic development of a scale-up phase. Methods: Principles from tivaevae and community-based participatory-research shaped the process by which the project team explored with stakeholders whether the pilot should be transformed to test the potential for the programme to grow, and benefits to evolve nationally. This process involved seeking, making sense of, and bringing together multiple perspectives to develop a vision and framework. Outcomes: Between June 2016 and August 2017 the notion of transforming the pilot to sustainable practice was explored with stakeholders, and a concept proposal presented to the New Zealand Ministry of Foreign Affairs and Trade (MFAT). In November 2017 MFAT invited the partners to develop a full design for this concept. The design centres around a scale-up framework aligned to the National Sustainable Development Plan. It comprises three components required to shift a pilot to sustainable practice. Vertical scale-up facilitates the process of policy, budgetary and systems practice change; Horizontal scale-up facilitates expansion to Pā Enua communities; Diversification scale-up enables emerging evidence to be applied and establishes processes enabling continuous improvement. This design, presented to MFAT in June 2018, will be reviewed to assess its potential to achieve the vision. Conclusions: The process of consultation and development has enabled the stitching of a strong framework. If funding is enabled, this frame can guide participating agencies and communities to build on the pilot to realise the long-term vision of young people engaged in building a better future for all Cook Islanders. Globally, small island developing states (SIDS) exhibit exceptionally high rates of non-communicable disease (NCD) risk and incidence. 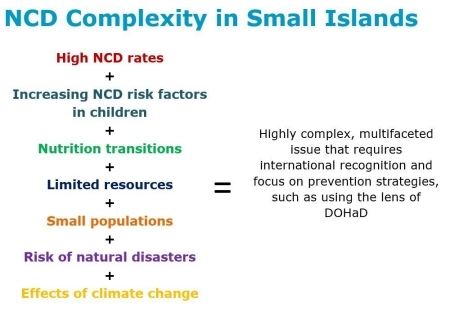 Despite this, there is a lack of context-specific research within SIDS focused on life-course approaches to NCD prevention, particularly the impact of the early-life environment on later disease risk as defined by the developmental origins of health and disease (DOHaD) framework. Given that globalisation has contributed to significant nutritional transitions in these populations, the DOHaD paradigm is a highly relevant. SIDS in the Pacific region have some of the highest rates of NCD risk and incidence globally. Transitions from traditional foods grown locally to a reliance on importation of Western-style processed foods high in fat and sugar is common. For example, the Cook Islands reports this transition, alongside rising overweight/obesity rates, currently 91%/72%, in the adult population. Increasingly, these trends are being observed in younger age groups with the Global School Health Survey reporting 63.7%/35.5% overweight/obesity in students aged 13-17 years old. However, research on early-life NCD risk prevention within this context, as in many low- and middle-income countries, is scarce. In these vulnerable, high needs countries, research on early-life factors influencing later health outcomes must be prioritised. Increasing contextually relevant research is crucial to informing NCD prevention strategies that can contribute to improving health and wellbeing for these at-risk communities. Background: Non-communicable diseases (NCDs) such as diabetes, cardiovascular diseases, and cancers are the leading cause of ill-health globally. They contribute significantly to social inequities. The burden of NCD risk and incidence, and associated socio-economic impacts are disproportionately high in low- and middle-income countries (LMIC), and communities experiencing social and economic deprivation in high-income countries. Although NCDs develop over time, most interventions focus on adult behaviours. School-based interventions offer opportunities to influence environmental exposures affecting future NCD risk. We explored and compared dietary patterns of students and the built-food environment surrounding one school in each of Nuku’alofa and Auckland. Methods: A questionnaire (n=100 Auckland; n=81 Nuku’alofa) examined dietary practices of 13-year-olds and awareness of the impact of early life environment on later-life NCD risk; spatial mapping explored accessibility and quality of food-stores surrounding each school. Results: Students in both settings reported poor nutritional practices. Purchasing lunch from on-site and surrounding food-stores was common. Significant differences were observed in the density of food-stores in a 1km radius of each school (n=52 Auckland, n=150 Nuku’alofa). However, contextually, the density of food-stores surrounding both locations was high. Poor-quality foods dominated in food-stores. Conclusions: This evidence provided schools with a snapshot of adolescent dietary practices and the surrounding built-food environment. Teachers identified that students could benefit from using food-store mapping as a learning activity to stimulate critical thinking. Schools intend to use the protocol to track evidence over time. This enables teacher-designed learning programmes to support adolescents to evaluate NCD risk critically. This study has the potential to be translated into other Pacific Island nations, such as the Cook Islands, where the NCD burden is high, and student empowerment strategies could improve health and wellbeing. 1. Liggins Institute, University of Auckland, New Zealand; 2. Te Marae Ora, Cook Islands Ministry of Health, Cook Islands; 3. Maraurau o te Pae Api’I, Cook Islands Ministry of Education, Cook Islands; 4. Tereora College, National College of the Cook Islands, Rarotonga, Cook Islands. Noncommunicable diseases (NCDs) represent a global crisis that is disproportionately affecting low and middle income countries such as the Cook Islands. Establishing health-promoting behaviours during adolescence may reduce the onset of NCD risk and incidence in adulthood for the individual and their future offspring. 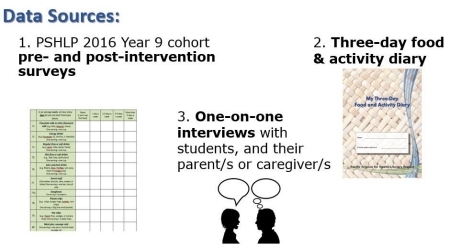 This phenomenological case study aimed to investigate factors associated with health-related decision-making and behaviours among 14-15 year-olds in Rarotonga. A mixed-methods investigation involving thirteen students and their parents/caregivers. Case study participants were selected from students in the 2016 Year 9 cohort of the Pacific Science for Health Literacy Project who reported at-risk behaviours for health-promoting and risk-promoting foods at baseline. Self-reported change in dietary behaviours was assessed using 12-week and 12-month post-intervention surveys. Student participants completed a three-day food and activity diary 14-months post-intervention, and an interview. Their parents/caregivers were also interviewed. Full pre- to 12-month post-intervention data assessing nine dietary behaviours was available for eleven of the thirteen students. At baseline, 88% of these self-reported behaviours were categorised as being at-risk. Positive shifts in 46% of these behaviours were reported at 12-months post-intervention. Key factors perceived as enabling healthy food decision-making and behavioural change included regulated access to spending money, authoritative parenting, access to filtered water, positive role models, motivation for sports scholarships, and having an active role in cooking in the home. Perceived barriers to healthy eating included a preference for unhealthy foods, time constraints, access to unregulated spending money, accessibility of junk foods in school, limited availability to healthy produce, and inadequate parental presence at home. Findings highlight the complexity of the interrelated personal, social and economic influences on health-related behaviours. This study offers the participating school evidence that could facilitate further exploration of these reported enablers and barriers within the staff, student and parent communities that may contribute to policy and practice. High rates of overweight/obesity and related non-communicable diseases (NCDs) are creating an intolerable socio-economic burden for the Cook Islands. Between 2003 and 2015, the relative proportion of overweight children aged between 5 and 12 years increased from 12.6% to 21.3%. For youth aged between 13 and 18 years, it increased from 28.4% to 43.4%. For the age group of 18-24-years, the rates of overweight/obesity reached 87.2%/68.5% by 2015. Children and adolescents are showing increasing signs of NCD risk which creates an urgent need to address the issue during this life stage. This study investigated associations between metabolic NCD risk factors and health-related knowledge, attitudes and behaviours (KAB) of Rarotongan students prior to participating in the Pacific for Science Health Literacy Project learning programme. A cross-sectional study protocol linked two data sets that provide matched anthropometric measures and KAB data from 133 students aged between 12-14 years old (64 Male, 69 Female). More than half of the participants were overweight/obese (63.3%) and showed raised blood pressure (BP) levels (58.1%). Overweight adolescents were 2.6 times more likely than healthy-weight adolescents to respond that what they eat matters ‘a lot’, p = 0.026. Obese adolescents were 2.7 times more likely than non-obese adolescents to consume regular fizzy/soft drinks, p = 0.058. Students with raised BP were 2.6 times less likely to not meet the recommended weekly intake of fruit (more than 4 days per week) compared to students with normal BP, p = 0.010. This study revealed alarming rates of obesity and raised BP among Rarotongan adolescents aged 12 to 14 years. Statistical analysis revealed that anthropometric risk factors were associated with risk-promoting dietary patterns. A follow-up study will compare data pre- and post-intervention. The team was well represented at the 2017 conference with presentations from Principal Investigator, Jacquie Bay, along with postgraduate students Siobhan Tu'akoi, Heimata Herman and Mayor Pokino. Presentation abstracts and slides are available for download. Background: Adolescence is an important life-stage for establishing health-promoting practices that impact lifelong non-communicable disease (NCD) risk. The Pacific Science for Health Literacy Project is a school-based partnership facilitating action-research examining the NCD crisis with those affected by the issue, for the purpose of education and action to effect change. Programmes link to the Cook Islands national curriculum, focussing on capability development associated with scientific and health literacies. Adolescents examine factors that promote poor environmental exposures, and develop evidence-based actions. Aim: To assess the potential of learning programmes exploring the NCD crisis in Years 9 and 11 to contribute to education, and primary NCD risk reduction in the Cook Islands. Methods: An individually matched repeated time-series design supported quantitative and qualitative data collection, recognizing the importance of individual change analysis within community-based interventions. Evaluation of concepts beyond the programme supported assessment of internal validity. Analysis to 12 months post-intervention occurred for 66% of the cohort (n=246). Results: We observed increased understanding of concepts associated with the NCD crisis, lifecourse NCD risk, and contributors to nutritional environmental exposures, retained at 12 months post-intervention. Application of critical thinking associated with understanding of the intergenerational nature of NCD risk was stronger in 15-year-old females (p'=.002) than in males or younger females. At least 50% of students reporting obesity-promoting nutritional behaviours at baseline recorded positive changes in relation to obesity-promoting foods at 12 months post-intervention (e.g. doughnuts, +ve change=73%, p<.001). However, 2-fruit/3-vegetable consumption remained low at <15%. Focus-group evidence confirmed that: behaviour change was in response to learning; 15-year-olds became strongly aware of socioecological challenges associated with fruit/vegetable access; students engaged peers and families in discussion of lifecourse NCD evidence and nutrition. Conclusions: Participation positively influenced nutritional attitudes and knowledge of evidence. It nudged long-term small, sustainable, behaviour-changes associated with obesity-promoting foods. Development is required within the national NCD strategy to address fruit/vegetable access. Do early-life environmental exposures predict the presence of NCD risk factors in Rarotongan adolescents? Tu'akoi: Do early-life environmental exposures predict the presence of NCD risk factors in Rarotongan adolescents? Non-communicable diseases (NCDS) are the leading causes of death globally. Although NCDs develop over time, numerous interventions focus on changing adulthood behaviours, once the disease has already manifest. The developmental origins of health and disease (DOHaD) concept asserts that environmental factors acting in the early-life period from preconception through to early infancy, can impact later disease risk in offspring. However, to date, the DOHaD paradigm hasn’t been explored in the Pacific Islands. 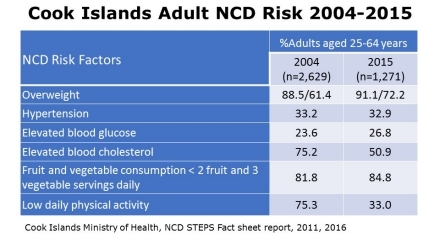 In the Cook Islands, more than 80% of deaths are attributed to NCDs. It is therefore important to explore avenues for disease prevention and how DOHaD might contribute to this NCD burden. In partnership with the Cook Islands Ministry of Health, a project explored DOHaD in Rarotonga, by correlating birth data with annual health data for Year 9s. Of the 70 students, two-thirds were overweight/obese, 59% (pre)hypertensive and 42% at increased risk for (pre)diabetes. One key result showed that larger newborns (measured by length) had a higher risk for increased cholesterol in adolescence compared to normal sized newborns. These findings linked to international research showing the influence of adverse early-life events on later health, further highlighting the early-life period as a critical window for intervention. This research will be extended to further investigate these associations and to explore how the findings could be used in practice to improve health in the Cook Islands. Research translation may include workshops, websites and print resources that children, parents and new mothers can utilise. In particular, a healthy nutrition resource, provided to parents across Australia and NZ, can be reformatted for use in the Cook Islands. Overall, this research will not only identify the impact of the early-life environment, but also how this data could be useful to the wider public, and the importance of this transition from research findings to practice. Herman: Supporting Health Assessments in Schools: Rarotongan Student Perceptions of Needs, Facilitators and Barriers. Background: The Pacific Science for Health Literacy Project is a community-based participatory research collaboration involving the Cook Islands Ministries of Education and Health, and the Liggins Institute. 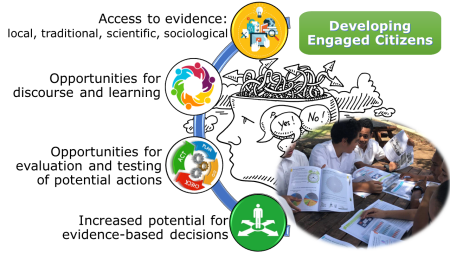 Central to the project are action-oriented learning programmes exploring aspects of the NCD crisis by looking at community, science and health evidence. Early evaluation evidence, combined with student feedback indicating a desire to know more about their own health data, resulted in a decision to incorporate metabolic health profiles in on-going evaluation from 2016. The Ministry of Health’s regular school-based health assessments provided a cost-effective opportunity for this. A purpose-built learning resource supported ongoing student exploration of NCD risk factors, helped students understand what health-checks involved, and enabled students to have a personal record of their own data. Aside from the monitoring potential, health-checks offer an empowerment opportunity. Access to individual health data combined with planned learning can promote health literacy. This can support informed decision-making that may promote positive health practices. This study explored experiences, benefits, and barriers to supporting positive engagement in health-checks in Rarotongan schools. Aim: To assess the health-check process from the perspective of students in order to identify potential benefits, issues, and improvements. Methods: Implementation process records and data from student focus groups (n=50) were analysed to identify themes. Results: Students reported heightened awareness of factors indicating their health, and viewed school-based health checks as having a primary role in improving health related knowledge, understanding and practice. Students also reported experiences associated with inadequate information about health-check processes, preconceived fears, poor explanation of results, and inadequate dietary advice. Conclusion: Overall the students reported strong support for the health-checks. However, issues associated with process were identified that should be considered for implementation. Pokino: Health vs Attitudes to Health in Rarotongan High School Students. Background: High rates of overweight, obesity and related noncommunicable diseases (NCDs) are creating intolerable social and economic burdens for the Cook Islands. Signs of NCD risk are evident in children and adolescents, creating an urgent need to address the issue during this life-stage. Between 2003 and 2015, overweight in 5 to 12-year-olds increased from 12.6% to 21.3%, and in 13 – 18 year-olds, from 28.4% to 43.4%. 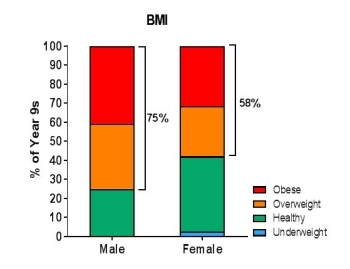 By age 18-24-years overweight/ obesity rates reach 87.2%/68.5%. The Pacific Science for Health Literacy Project (PSHLP) is a participatory action research project involving the Cook Islands Ministries of Education and Health and the Liggins Institute. Using opportunities within the Cook Islands national curriculum, learning programmes see young people exploring aspects of the NCD epidemic and the socioecological factors that are contributing to this crisis. Phase I demonstrated that this intervention is supporting adolescents to understand more about the issue, and take actions that are within their control. Phase II build on this, adding in assessment of the impact of the programme on metabolic health indicators. Aim: To investigate associations between NCD risk factors and health/lifestyle related knowledge, attitudes and behaviours in Rarotongan adolescents prior to participation in PSHLP learning programmes. Method: A cross-sectional study protocol will link two anonymised data sets collected via approved studies led by the Cook Islands Ministry of Health and PSHLP. Matched data is available from 163 Rarotongan 13 to 14 year-olds. Individual identity is protected via the use of participant codes, ensuring anonymity. Data analysis will seek to identify associations between NCD risk factors and health/lifestyle related knowledge, attitudes and behaviours prior to the learning intervention. This study is contributing towards completion of a Masters of Health Science degree for Mayor Pokino, funded by the Health Research Council of NZ. The team was very well represented at the 2016 conference with presentations from Delaney Yaqona, Celeste Barrett-Watson, Jacquie Bay, Heimata Herman and postgraduate student, Siobhan Tuakoi. In addition to the Ministry of Health staff who are core to the project team, conference attendees included Associate Professor Mark Vickers from the New Zealand team as well as a strong contingent from the Ministry of Education led by Ina Herrmann and Kathleen Wylkie. Presentation abstracts and slides are available for download. Exploring nutritional attitudes and practices of Rarotongan 13-16 year olds via a population wide school-based survey: Implications for NCD vulnerability and school-based health-promoting interventions. Jacquie Bay, Karen Tairea, Delaney Yaqona, Celeste Barrett-Watson, Tania Morgan, Mark Vickers, Upokoina Herrmann (2016). In The Annual Cook Islands Health Conference 2016. Rarotonga, Cook Islands. Average weekly fruit and vegetable consumption patterns; Rarotongan Year 9 and 11 students 2014-15. Click here to open the full presentation. Background: The Cook Islands is burdened with very high rates of adult obesity and related noncommunicable disease (NCD) morbidity and mortality. Adolescence is now identified by WHO as a key behavioral intervention point to support primary NCD risk reduction for youth and their future offspring. This study assesses the nutritional attitudes and practices of 13 to 16 year-olds attending schools on the island of Rarotonga, providing evidence to inform development and assessment of school-based nutritional interventions. Methods: A school-based survey of Rarotongan Year 9 and 11 students was conducted under supervision in class-time during 2014 and 2015. Permission was sought from parents of all eligible adolescents (n=641). Participation from 63% of eligible adolescents (n=402) was achieved, male 50.8%, female 49.2%. The cohort comprised 59.5% Year 9 students (median age 13y10m) and 40.5% Year 11 students (median age 15y6m). Results: 17.8% of participants (female 15.2%, male 20.4%) consume at least 2 fruit and 3 vegetable servings daily. 70% of participants do not meet WHO recommendations for sugar sweetened beverage consumption; 80% of participants consume doughnuts weekly; 38% consume doughnuts >2 days per week; 35%, when eating doughnuts consume > 2 servings. Weekly consumption of hot-chips is normal for 85% of participants with 42% eating hot-chips >2 days per week. Breakfast is consumed daily by 22.7% of participants (male 27.1%, female 18.3%). 50% of participants eat an evening meal with family at least 5 days per week. 95% of participants consume deep-fried takeaways regularly; 55% consuming these more than once a week. Conclusion: Nutritional behaviors associated with increased NCD vulnerability are clearly evident, and it is known that nutritional behaviors established in adolescence carry through to adulthood. 50% of secondary students in Rarotonga are overweight. Investment in empowering youth, educators and families to understand and address this risk should be prioritized. 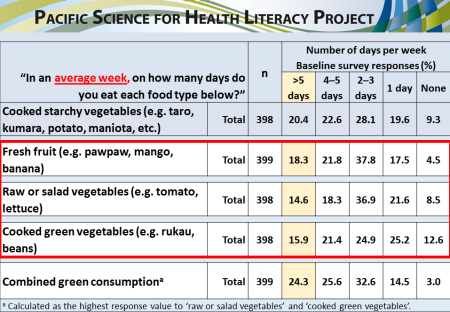 Combining health prevention with education in science and social studies classrooms: The experiences of teachers in the Cook Islands in the Pacific Science for Health Literacy Project. 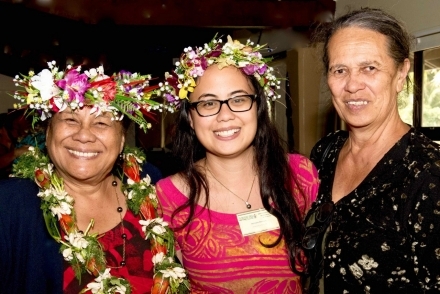 Delaney Yaqona, Celeste Barrett-Watson, Karen Tairea, Jacquie Bay. (2016). In The Annual Cook Islands Health Conference 2016. Rarotonga, Cook Islands. Background: The Pacific Science for Health Literacy Project is a community-based participatory research collaboration involving Cook Islands Ministries of Education and Health, and the Liggins Institute. Based on principles of multi-sectoral partnership, the project has developed learning resources to support youth empowerment in relation to noncommunicable disease (NCD) risk, valuing equally goals related to education and health. The project has placed teachers of Social Studies, Science, and Health and PE in the role of health promotors through their development and use of contextual learning programmes that link directly to the Cook Islands National Curriculum. 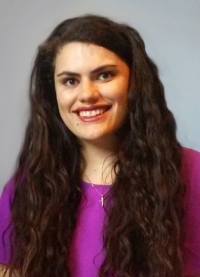 In addition to the development of resources for youth, the project leadership team has developed resources to enable teachers to examine the issue of NCDs from a Cook Islands perspective, understand the evidence, and embed examination of this evidence into an array of innovative learning resources for use in schools. Methods: Qualitative and quantitative methods have been used to understand the experience of participating teachers and students. Results and Conclusions: We report here on the experience and reflections of two senior teachers, neither of whom have a background in biological sciences or health, working alongside the Ministry of Health and the Liggins Institute to combine knowledge of education, health, social science and science in the development of this project. We will present evidence of increased engagement in learning alongside evidence showing significant changes in the perceptions of teachers and adolescents regarding the importance of health and wellbeing, and their potential to influence personal, family, and community health and wellbeing. We present this alongside our experience in engaging with the World Health Organization in relation to this project, and our role in working within the Worldwide Universities Network Public Health Schools group to develop improved international understanding of the role of schools in supporting reduction in NCD vulnerability in youth. Ensuring that Cook Islands youth understand health monitoring in which they are participants: Linking health monitoring into learning through the Pacific Science for Health Literacy Project. Heimata Herman, Karen Tairea, Upokoina Herrmann, Celeste Barrett-Watson, Kathleen Wilkie, Delaney Yaqona, Tania Morgan, Mark Vickers Jacquie Bay (2016). In The Annual Cook Islands Health Conference 2016. Rarotonga, Cook Islands. Background: The Pacific Science for Health Literacy Project is a community-based participatory research collaboration involving Cook Islands Ministries of Education and Health, and the Liggins Institute. Based on principles of multi-sectoral partnership, the project utilises innovative learning and teaching strategies to support opportunities present in the Cook Islands National Curriculum to facilitate youth empowerment in relation to noncommunicable disease (NCD) risk. The project team identified in 2013 that while health monitoring should ideally be a part of project evaluation, the education sector and wider community were not at that stage ready to embrace this. The presentation of baseline nutrition data to participating teachers during 2015, combined with teacher observation of increased levels of student engagement, and increasing teacher understanding of the relevant health issues resulted in a joint decision to incorporate basic anthropometric and metabolic profiles in baseline and on-going post-intervention evaluation from 2016. Methods: To support empowerment, health monitoring must be an active learning experience. 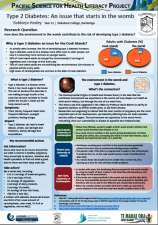 To facilitate this the project team have produced a resource explaining the health monitoring checks, alongside relevant NCD risk information. 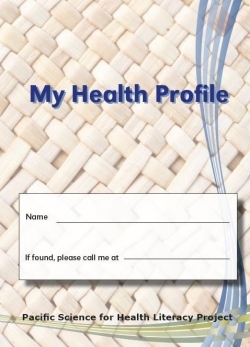 All Year 9 students will receive this booklet to record their health profile annually during secondary schooling. A website provides information for parents and professional development will support all teachers in participating schools to understand the profiles. Health and PE teachers will incorporate exploration of the profiles in the cross-curricular learning modules associated with the project. Public health will ensure that appropriate follow-up is available. Results and conclusions: We present here the journey that led to this decision, the learning tool and the updated evaluation plan. We hypothesise that these resources will increase youth empowerment, measured via sustained health-promoting actions and gradual health profile improvement. We will test this hypothesis within the 2016 Year 9 cohort in Rarotonga. 95% of parents have provided consent for student participation. Non-Communicable Disease Risk Factors in Rarotongan Adolescents: Examining links to early-life experiences. Siobhan Tu'akoi, Karen Tairea, Mark Vickers, Jacquie Bay. (2016). In The Annual Cook Islands Health Conference 2016. Rarotonga, Cook Islands. Background: The Cook Islands has extremely high rates of noncommunicable diseases (NCDs). It is estimated that in the Cook Islands NCDs contribute to 74% of all deaths, 36% of which occur prematurely, prior to age 60. With an obesity rate of 67.9% in reproductive-age females, there is an increased risk of pregnancy complications and offspring obesity later in life. The Developmental Origins of Health and Disease (DOHaD) concept looks at the influences of the early-life environment on later health. This pre-feasibility study was a collaboration between the Cook Islands Ministry of Health (CIMoH) and the Liggins Institute, funded by the University of Auckland Faculty of Medical and Health Science Undergraduate Summer Studentship Programme. It explored whether using existing CIMoH data, associations between early-life environmental exposures and adolescent obesity could be examined to potentially inform life-course based NCD risk interventions. Methods: By matching data from the Rarotongan Hospital Obstetric Registers and CIMoH School Health Examination data, a sample group of 68 adolescents was formed. Trends were explored between the birth factors found in the registers (e.g. birth weight) and the health examination data of each adolescent (BMI, blood pressure). Results: This study found that children whose births had antenatal risk factors listed (e.g. preeclampsia, gestational hypertension) were more likely to have overweight/obese BMIs and (pre)hypertension than those without listed factors. It was also found that first-borns were more likely to be overweight/obese in adolescence compared to non-first-borns. These relationships suggest that the early-life environment can influence later health and obesity risk in the Cook Islands population. Conclusions: This pre-feasibility study identified that using standard data collected by CIMoH to investigate associations between early-life environmental exposures and adolescent overweight/obesity would be viable and could inform opportunities for early-life obesity prevention. Karen Tairea and Jacquie Bay presented an overview of the project. Learning resources completed at the point of the conference were received by Gail Townsend, Secretary of Education and Elizabeth Iro, Secretary of Health. Poster presentations representing the work of Year 11 students from Nukutere, Tereora and Titikaveka Colleges in 2014 were presented to the conference. The student posters are summaries of research reports developed by students to fulfill the requirements of the summative assessment task associated with the learning and teaching module "Te Maki Toto Vene (T2): E Manamanata no Toku Iti Tangata" (Exploring Type 2 Diabetes: A Socio-Scientific Issue for My Community). In this learning module students explore the type 2 diabetes epidemic in the Cook Islands, looking at biological and social determinants as well as impacts. Each student is required to undertake a specific inquiry, refining a question from the overarching question - why is type 2 diabetes an issue in Cook Islands communities. This links to NCEA Level 1 Achievement Standard 90926.